1.1 These terms and conditions of sale (“general conditions”) define the terms and the conditions of sale between Luxedo di Alessandro Moimas, owner of the website www.luxedo.it (“the website”) and the purchaser who acts for personal purposes and non-professional (“customer”) and who intends to purchase the products offered by luxedo on the website (“the products”). 1.2. The present general conditions concern the remote sale via internet to retail consumers of products, governed in particular by Legislative Decree no. 206/2005 (“consumer code”) and by Legislative Decree no. 70/2003. 1.3. 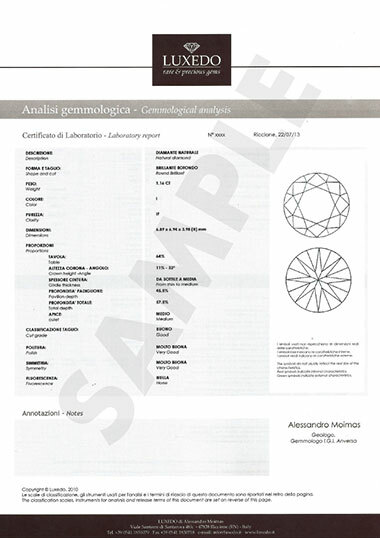 For “the seller” it is interpreted as the firm Luxedo di Alessandro Moimas, c.f. MMSLSN73M17E098L and p. VAT 03845570401 with its headquarters in Riccione (Rn) on Viale Santorre di Santarosa 48 / C.
1.4. For “the customer” it is interpreted as a consumer who is 18 years of age and is a resident in the countries where the website is authorized for online sales. 1.5 These general conditions can be changed at any time by the seller. The version of the general conditions published at the time of conclusion of the contract will be considered between the parties. Luxedo can not under any circumstances be considered bound by the conditions sent by the customer or otherwise different from those present. The prices, products on the website, and features are subject to change without notice. 1.6 The acceptance of these conditions by the customer is essential for the completion of the purchase procedure of the products according to the methods described in the following point 2. 2.2 In the standard purchase mode, the Customer, through the “Shop online” section on current the website www.luxedo.it, can choose the item to be purchased and enter it in the appropriate section of the website “Shopping Cart”, where the features of the products, price, applicable VAT, shipping costs and expected delivery times are located. Registration and access to the site, as well as the use of the e-commerce service are totally free. 2.3 The order is sent following the insertion by the customer in the appropriate section for payment, shipping data and data necessary to make the payment, requested by the intermediary in charge. This data may be modified until the moment when the payment procedure is actually completed. 2.5. The sales contract of the product is concluded when Luxedo receives the payment of the price by the Customer. 2.6. The validity of the contract is subject to the availability of the Product. In the event that the Product is no longer available, Luxedo will notify the Customer within 7 days of receipt of the Order and reserves the right to terminate the sales contract, returning to the customer the full paid price, without any additional charge or burden of kind borne by Luxedo. 2.7.The order that is displayed by the Customer and sent by email from Luxedo reports all the essential elements of the contract, including all the information required by law. The Customer is required to check the order and verify that the information contained is correct and complete. A “customised product” is defined as a piece of jewelery made to the customer’s specific request, on the size of the gem chosen by the customer and on the model chosen by the client, among the models presented in the online catalog or on the basis of specific customer specifications. If the customer decides to continue by finding the proposed price estimate to their liking, he or she can approve the order confirmation document containing the summary of the conditions applied by replying via email. Up until the sending of the order confirmation email sent by the customer, the request for a price estimate is not binding and will not entail any charges. A copy of the order confirmation will be sent by e-mail to the customer as indicated in point 2.4; It will be possible to make up to 2 customizations of the product included in the indicated price. Further customisations that may be requested by the Customer will be charged according to the working time that they will require. Once the personalised article has been completed, Luxedo will inform the Customer of the email address indicated by him, who will be obliged to pay the remainder of the total price within 10 days from the receipt of the confirmation email. In case of non-payment of the balance within the established terms, the contract will be terminated by right and Luxedo will be entitled to retain the amount already paid by the customer, subject to the right to compensation for damages according to the general rules established by article. 1223 c.c. For this method of purchase, pursuant to Article 59 letter c) of the Consumer Code (Legislative Decree 206/2005) the application of the Right of Withdrawal is excluded, as also indicated in the following point 8. All goods purchased with the “Standard” procedure are available at our premises and the gems are generally shipped within 24 hours. All of our shipments are covered by insurance for the full value of the goods sent. By entering the selected item in the cart, the shipping cost will be automatically calculated based on its value and the destination area / country. Our parcels are closed with security tape and if the parcel is open or damaged, we advise you to refuse it or to accept it with reservation, otherwise the insurance may not cover any possible damages. At the time of delivery, the Customer is required to verify the integrity, quantity and type of Products delivered, the fact that they comply with those ordered and as provided by the Contract, the fact that the packaging is intact and not damaged, doing inspections that can be carried out on the basis of ordinary diligence and immediately notifying the courier with any annotation on the delivery note or any discrepancy with the order. The shipments are made by express courier with delivery within 48 hours (72 hours for the islands) or through armoured vehicles for goods worth more than € 1,600 with delivery within 72 hours. The delivery times indicated by the carriers may be delayed in exceptional cases of bad weather or for delivery to disadvantaged areas. For delivery to the islands it is usually necessary a day longer than indicated. Goods within the European community can travel freely and there is therefore no additional cost of customs clearance or duties. Shipments are made by express courier and delivery times vary from 2 to 5 working days. Outside the European community, goods are subject to customs inspections by the destination country. Any costs of customs clearance or taxes are the responsibility of the purchaser. The shipper can contact the recipient for any eventual bureaucratic import procedures. The customer is responsible for the importation in his country and the packages that are not picked will be subject to variable costs and non-refundable for return to the sender. Shipments are made by express courier and delivery times vary depending on the country of destination. It is possible to purchase or to have an option on the gem in order to collect it directly at our Riccione store without any additional cost. The final price is inclusive of VAT, and may include delivery costs, if this service has been included in the estimate or specifically requested when ordering online. The Customer is required to make payment to Luxedo through the payment method made available on the website. The delivery of the Products will be made only after payment has been made. The Customer is required to guarantee the veracity of his or her data provided during the procedure foreseen for the stipulation of the Contract. The Customer undertakes to promptly notify Luxedo of any changes related to his personal data provided during the contract process by sending a specific notice to Luxedo. 1.With regards to customers “consumers”, the provisions are applied relating to “consumer goods” as per the Consumer Code (Legislative Decree 206 of September 6, 2005), and in particular the legal guarantee of conformity pursuant to article. 129, as well as the current applicable provisions in the matter. 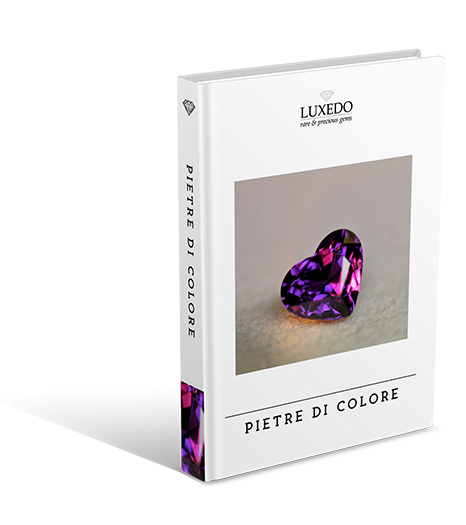 All LUXEDO jewels are accompanied by a guarantee that certifies the authenticity and conformity of our creations, the nature and the quality of precious stones and diamonds. 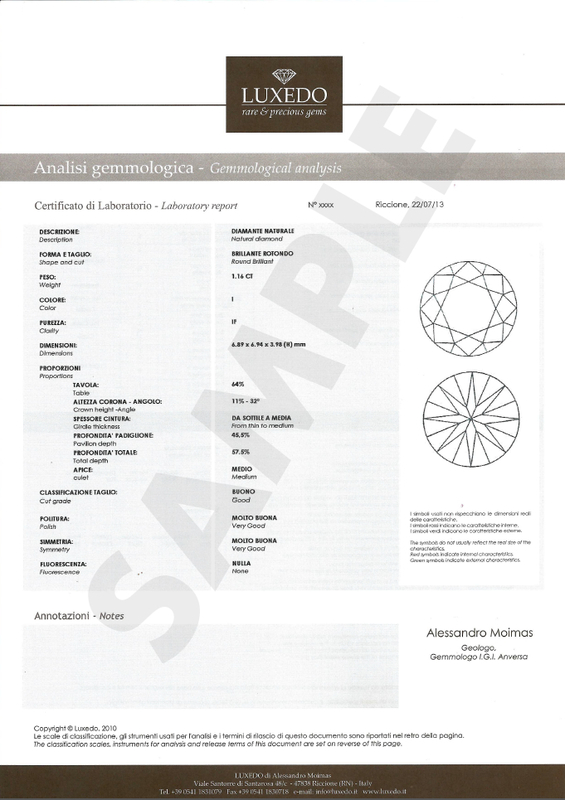 The gold title used, as described in the paper guarantee, is also guaranteed by the punch applied on each goldsmith product according to the Italian / European standards in effect (e.g. punch for 18 kt gold). 8.1. Pursuant to articles 52 and ss. of the Consumer Code, the Customer that qualifies as a “consumer” in accordance within the Consumer Code has the right to withdraw from the contract at will, without penalty and without specifying the reason, within the term of 14 (fourteen) working days starting from the day of the delivery of the products. the products must present the conditions of the new, without signs of wear, abrasion, nicks or scratches. The goods must be returned to our office in via Santorre di Santarosa 48/c, 47838 Riccione (RN). The costs of shipping and return insurance, as well as the proper packaging of the package, are at the customer’s expense. the customer is deemed to be solely responsible for the goods up to the point of delivery and will have to respond, as such, in case of loss, damage or theft of the same. Luxedo reserves the right to refuse returns in the event that evident signs of damage or alteration of the products are assessed. Within 10 days of acceptance of the return, Luxedo will reimburse the amounts paid by the customer with the exception of shipping costs incurred at the time. Shipping costs incurred by the customer are refundable only in the case of our assessed error. The right of return can be guaranteed for all countries belonging to the European Free Trade Association. For the purposes of the contract the written form includes any communication by electronic means that allows a durable recording of its content (such as, for example, email messages and html pages). 10.1 The Contract and the related order documents are stored, saved and archived by Luxedo at its headquarters, for the requirements necessary for the execution of the contract, as well as for the related obligations and the requirements required by law, in compliance with the Privacy Code (D legislative decree no. 196/2003).
. The Customer may request that Luxedo be provided with an electronic and / or paper copy of the Contract, against payment of the cost of reproduction and from the support provided. 10.3.In each case, the Customer is required to store, save and archive an electronic and paper copy of the Contract. The processing of personal data provided by the Customer will be in compliance with the provisions of Legislative Decree June 30, 2003, no. 196 (“Code regarding the protection of personal data”) and its subsequent amendments and integrations. At this end, Luxedo provides the Customer with specific information always available on the Website at the following link: Privacy. These General Conditions and the related Sales Contract concluded between Luxedo and the Customer are governed by Italian law and in particular, by Legislative Decree no. 70/2003 on electronic commerce as well as with reference to consumer customers only, as defined above in article. 1, Legislative Decree no. 206/2005 (Consumer Code), without prejudice to mandatory provisions of the law of the country of residence of the customer that may be applicable. 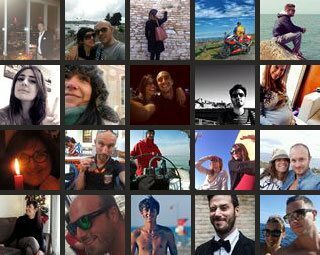 For anything not expressly provided for in these general sales conditions, the current Italian law applies.